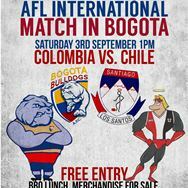 The inaugural international match between the new Colombian team the Bogotá Bulldogs and the Santiago Saints from Chile has been played on the weekend with victory going to the Bulldogs. The final score saw the ‘Dogs down the Saints 94 to 48 to be the first winners of “The Andes Cup”. Teams were applauded for their effort playing in Bogotá, a city which sits at an altitude of over 8,000 feet above sea level – testing the aerobic capacity of all players. As the Bulldogs proudly state, their team plays and trains at an altitude of over 2600 metres above sea level, which is the equivalent of playing at the summit of Mt Kosciusko – Australia’s highest peak. The following story comes from The Bogotá Post newspaper in Colombia, South America. For years the Santiago Saints have waited for an opportunity to play against other clubs, especially since the falling away of the teams in Argentina. The article, written by Kieran Duffy (and photos by Travis Crockett) gives details to date of the upcoming event. We're all familiar with players trying to raise money to head Down Under for the International Cup so this one is a little different. 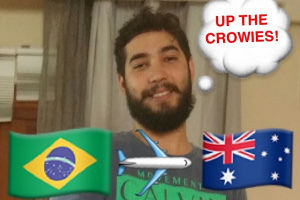 Porto Alegro's Thiago Vacile has quickly become a keen Adelaide Crows supporter and posted about his passion for the team Adelaide fan Facebook page Adelaide Crows Pride. Suddenly there was a groundswell of support to try to raise funds to send him from Brazil to Australia to see a Crows game at Adelaide Oval. With the Pride of South Australia climbing to 2nd on the AFL ladder this weekend it seems a good time for Thiago to make the trip. You can read more about the push on the Footy Almanac here or chip in a few dollars here. Santiago Saints looking towards a bright future. Aussie Rules footy is about to grow extra legs in one of the world’s farthest flung locations for the game. Chilean club, the Santiago Saints, have steadily developed in the five years of operation since 2008, and hope to see further expansion in 2014. An update from the Santiago Saints, based in Santiago de Chile. The Saints have now been a club since 2008, with a mix of Chilean and expat players. We have had a number of players visiting or living in Chile involved with the mining industry and this has seen players with experience in the lower leagues in Australia pass on their knowledge to other players. 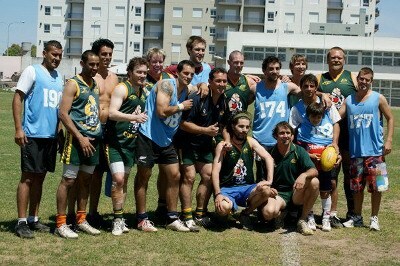 2012 saw a great charity match, with huge support from the Australian Embassy as well as other sponsors. In 2013 the club is looking to lock in sponsors for a long term period, ensuring stability for the future. Last year AFL talent scouts had their first look at South America, with trials held in Buenos Aires (see Search for talent in Argentina). The initial outcome was two players featuring in the World XVIII that played in the NAB AFL Under 16 Championships last year. It seems the search may now turn to Brazil. Jon Pierik in the Sydney Morning Heralds reports that player agent Peter Jess is hoping to interest Collingwood in growing the program in 2011. ''I will be talking to Collingwood next week about holding some camps there [Brazil],'' Jess said. ''There will be a group of people working within Brazil, members of the Brazilian Olympic Committee, who have agreed to act as talent scouts for us.'' See The Boys From Brazil for the full article. Over the last decade Australian football has taken big strides in laying down some roots internationally. Many of those started off as tiny projects to use footy to bring some fun to poor communities; some such projects remain at that scale and whilst never likely to make big headlines are great initiatives as they are. 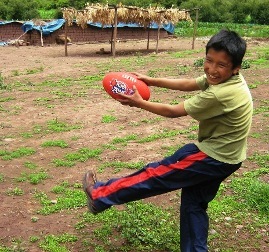 One current program is being run by expat Aussie Simon Corcoran in a remote area of Peru. worldfootynews.com had a chat to Simon about the people and the footy there and where his dreams would see it all go. The Convicts' tour of South America continued on 23rd October with a match in Buenos Aires against Argentina's Eagles, who were captained by Martin Parsons. With both squads low on numbers and limited facilities available the match was played with soccer goals instead of footy posts. After a hard fought match the visitors emerged with a 4-3 victory. Silsirado Diego (Argentina) was selected as the best player in the game. Details have been slow to filter out of South America but the final match was scheduled against a Brazilian squad. In perhaps one of the most surprising results of the international football year Chile's Los Santos (The Saints) have defeated the touring Convicts side in Santiago, inflicting possibly only their second loss (the first in 2007 to the South African national side in Soweto). It's difficult to gauge the standard of play in South America given that there are few clubs and until now no cross-over matches against teams from other continents. And although the Convicts is a tourist group of Australian footballers which changes every year, they normally provide a good contest that is more than enough to defeat the locals. Of course the calibre of any particular tour party is unknown and these matches are friendlies so you can't be sure how determined to win each team was, and the South Americans appeared to have some expat-Aussie assistance, but still, it was obviously a fine victory for the locals and should provide them with confidence and motivation to keep growing the game moving forward. ¡Felicidades a todos en Los Santos! The Convicts are back on tour again, departing Australia on Tuesday 19th October heading to South America for the first time. 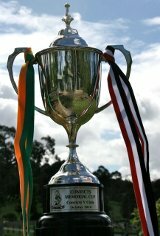 The Convicts concept involves bringing together a group of Australian footballers keen to play some footy overseas while paying their way to have a holiday as well. The tour involves three matches: in Chile against the Santiago Saints, in Argentina and finally in Sao Paulo in Brasil. 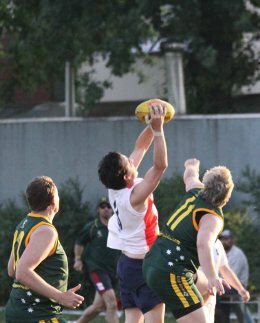 worldfootynews.com caught up with Adrian Barraza who is involved with Aussie Rules in Chile, to ask him how the year has gone so far and what impact the Convicts tour might have.